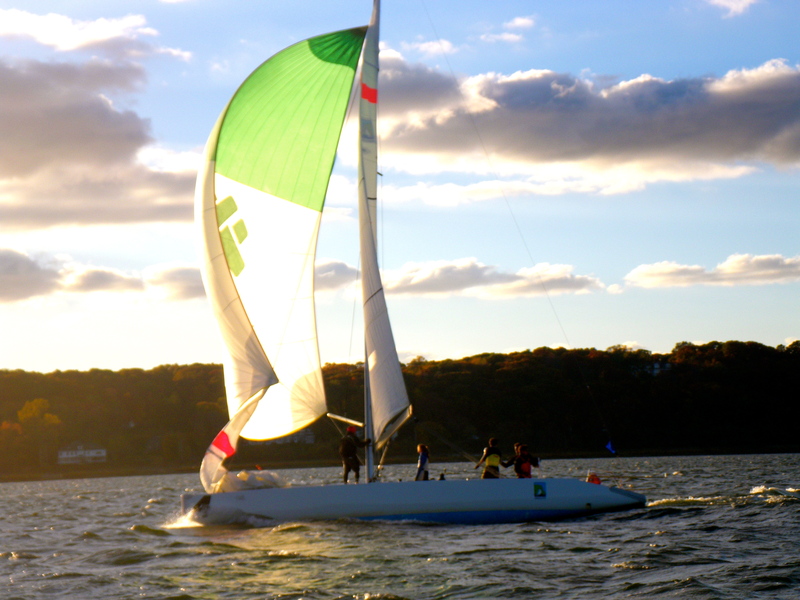 November 3, 2013—Balmy and breezy conditions transitioned to light and shifty, and finally to a frigid and gusty Northwesterly for the Oakcliff Halloween Invitational. This was a true test of the teams’ adaptability. It was also a test of the team’s ability to avoid the committee boat. Some were more successful than others. The regatta was won by Chris Poole who sailed with Oakcliff SapGrads—Chris Kennedy, Solomon Krevans, John Coburn, plus his sister Holly. 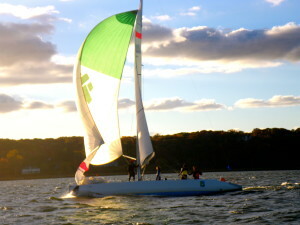 At the awards ceremony Poole said, “It was some of the best match racing of my season,” but at the same time he was prompted to apologize for hitting the Committee boat. In the Oakcliff fashion he will be reducing the amount of his damage charges by assisting in the repair. Fraizer and his team which also included SapGrad Max St.Maurice only lost two races all weekend but they were the two that counted and he finished strongly in second. David Niemann fought through from a slow start finishing sixth in the round robin and fighting through the quarterfinals to finish third.